And this was an Almanack from about two years ago, showing how prescient I was in predicting McClellan would write a book, though I was all wrong on the book itself. I was also wrong in spelling "McClellan". 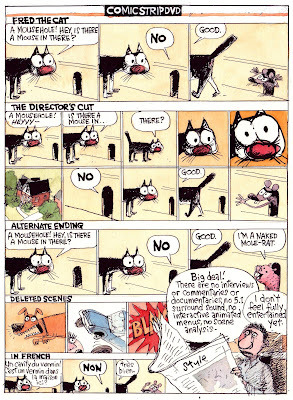 Fixing this mistake, I clearly recall, made Washington Post's Ace Comics Editor Suzanne Tobin late for dinner. 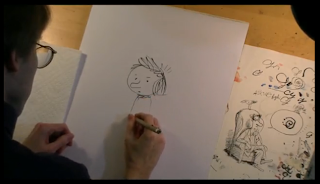 And notice how very much this drawing of McLellan resembles the more recent drawing of McClellan. It's almost eerie. Here are some old things to share while I compile my massive & exhaustive report on My Visit to New Orleans. Back in the early '90s ace Wash Post reporter/Renaissance Man Joel Achenbach wrote a weekly column called Why Things Are. He'd been doing it for the Miami Herald, and when he came DC he kept it going. The deal was, he'd answer any question, especially if it was interesting, but the question had to be a Why question. Like, Why do you see stars when you rub your eyes, Why are there no green cars, Why are aliens always bald, Why don't we slosh around more since we're mostly made of water? The only non-Why question I remember him answering was What does the inside of your nose smell like, and I think that was adroitly rephrased into a Why question. And my job was, I got to illustrate Joel's column. It was a dream job; they never cared what I did, so long as it was spelled right and wasn't salacious, and the subject matter was so far-ranging and the column's tone was so sprightly that the only work was in keeping up with Joel. 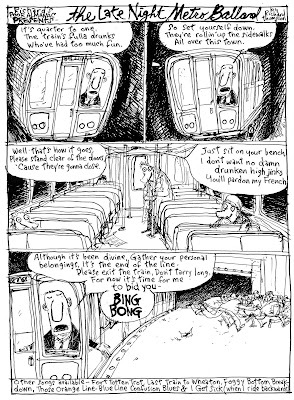 Gene Weingarten edited the column, and it was after working with him on Why Things Are that he suggested I try a weekly cartoon. These are some old Why illustrations I found in a drawer yesterday while looking for an old drawingof Scott McClellan. Why didn't the Black Death kill everybody off? Why does everybody drive so fast? Why are Beavis & Butthead funny? Why does food spoil? Or something like that, all the other ones had a note on it except this one. It might've been Why does the Seven Eleven sell those revolting hot dogs? For which there is no answer. I've looked like this since getting back from New Orleans. My brother says time is measured differently in N.O., so maybe it's some kind of time-travel-continuum loss and when I returned to the real world I lost more than the five days I spent there. More later. But no real photos of the Reubens; I forgot to take a camera, then bought a disposable camera, then most of the time forgot about it, too. This is why I draw I guess, though I didn't draw much of anything while I was there either. Here I am at the Reubens in New Orleans. That's me, with a beer (just like always, ha ha!) in between Mark Tattuli and Mike Mikula at Broussard's Restaurant on Sunday night. And yes, that's about as clear as things were this weekend. Ha ha! 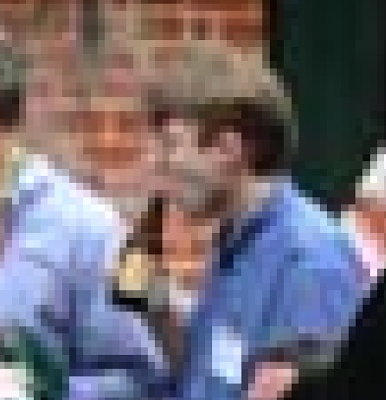 No shiny divisional award plaque for me, but lots of happy, blurry memories. More to come when I can remember it. 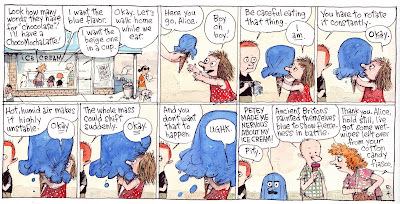 On Friday at 1 pm several cartoonists attending the NCD deal will have a live online chat courtesy of the Washington Post, and I'll be one of them. Please, no hard questions or recipe requests. I'll be out of town till next Tuesday (see previous post). See you all then, and I'll have vacation photos to share! Oh boy! Till then, please leave a funny joke, riddle or anecdote in the comments. This coming weekend is the National Cartoonists Society's annual Reuben Award Convention Thing, and guess who gets to go? Well, lots of people, but one of them is me. 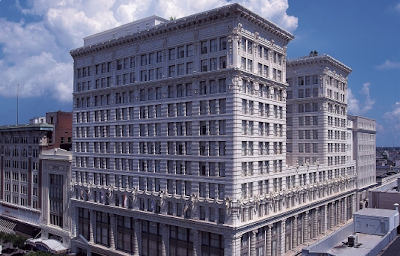 It's in New Orleans this time, at the Ritz Carlton in the French Quarter no less (see photo above). I've never been to New Orleans, so I'm really looking forward to it. To get there I'll board the Crescent Express, an Amtrak train that takes about 26 hours to reach the City That Care Forgot (so called by Mark Twain). I'm taking a book, or maybe a whole bookcase. I'm attending this year's Reubens because I'm up for an award. 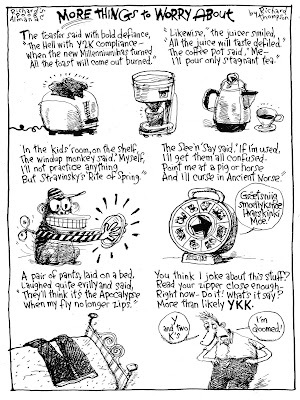 Every year the NCS bestows a Reuben Award, named after Rube Goldberg, on the Cartoonist of the Year. I'm not up for that, I'm up for one of the division awards, the division being "Newspaper Strips". Here's the full list of divisions and nominees, and here's the list of those up for Cartoonist of the Year. I'm up against Paul Gilligan of Pooch Cafe and Jim Meddick of Monty, both strips I like a lot. It'll be an interesting and a fun trip, even for a stick-in-the-mud antisocial guy like me who never leaves the house much except by astral projection. 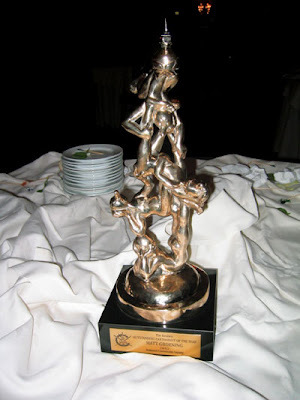 Above is a photo of an actual Reuben Award, as designed by Rube Goldberg (it looks like it comes with a set of dinner plates, too). Originally it was to be a lamp, but it was converted into a trophy. Kind of a pity because it'd be a great lamp, especially if there was one on either side of a very ugly sofa. So I won't have much to say here for a while, though a bit later I'll add the story of the only other time I went to a Reubens thing, back in '96, and how my rental tuxedo pants didn't fit. Above is a photo I found on Google Images under "Crescent Express", which worries me. I don't think I can sit on that thing for 26 hours. This is the original, slightly different, version of today's Cul de Sac. It's drawn from life, as we have a Baskin & Robbins about three blocks from the house, and I've never been able to eat an ice cream cone neatly. I can recall eating an ice cream cone once when I was about six and having my usual trouble with it, and hearing my aunt say to my mom, "How'd he get it in his socks?" It's a skill I've passed on in varying degrees to both my daughters. Another thing I've always had trouble with is drawing food. When I try to, I end up with a mass of lumps colored brown or green, with red specks. But I do like this drawing of an ice cream cone, drawn for the Diabetes Association about 20 years ago. I like the lumpiness of the background and the textures in the ice cream (pistachio?). I wouldn't care to eat that cone, as I'd probably drop it and kill myself, but also because I'm just not a huge ice cream fan. Usually about halfway through eating it I get bored with it and give it to somebody else. Now pie, that I'll fight you for. Here are two poems from back around 1999. Neither of them has a reason to exist any more (in French that's raison d'etre), but I still like them, and what better place to put outdated poetry than a blog? The Lit'rate Snob comes from when the Wash Post bundled all their Sunday color stuff in the same bag; it came separately, with the comics wrapped around the whole thing. 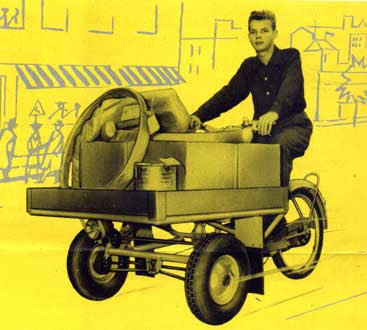 Inside were the color ads, the TV section, the Magazine, and Book World. And every once in a while a letter to the editor would appear in the Post complaining about having to wade through all the other color stuff to get to Book World, like the letter writer couldn't bear to touch the comics on his or her way to the book reviews. So I drew this thing. See? It's hard-hitting material like this, and my willingness to go after issues that no one else will touch, that got me my Pulitzer. This one comes from our misguided fear that when the year changed over to 2000 all our computers & electronics would be confused and everything would collapse. Ha ha! We were such dummies! But I knew better! Hope you enjoyed them. Someday I'll post my 250 page epic graphic poem about the rescue of all those dentistry students in Granada. Newt Gingrich seems to be on the resurgence. I guess it's because the Republican Party is suddenly a great, yawning chasm and he's rushing in to fill it. There, that's my political insight for the month, or year even, and god knows it's probably wrong. I'm just waiting for the movie, when they put a white wig on Jack Black and tell him to ham it up. I did this for USNews back when, around the time Speaker of the House Gingrich, the Home-Grown American Political Genius gathered his forces and shut down the government in a budget fight with Clinton. 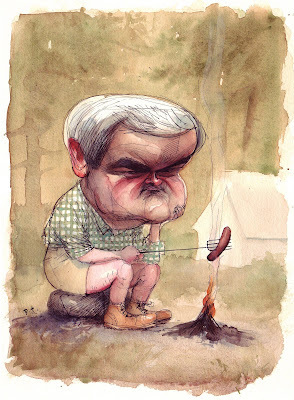 Or more likely it's from somewhat later, when Gingrich was out as Speaker and suddenly had some time on his hands to go camping and roast wienies. Whatever, he's fun to draw, with that enormous, tetradodecahedral head and that teeny, obnoxious mouth. According to the alert historians at the Janus Museum , May 14th is National Folksong Day. Since it's never to late too celebrate anything, here are a few folksongs to learn and share with your friends, especially if you own a guitar and have no real talent for music. I used to ride the Metro a lot, especially when I lived up in Gaithersburg at the end of the Red Line, which means that I used to doze off on the Metro a lot. I never missed my stop because of dozing, though I had a number of near-misses. One night after I exited the midnight train at the Shady Grove station (the last on the Red Line), I was walking along the platform, watching the now-empty train sliding past into the trainyard beyond, and in one car sat a very startled woman who looked sure that she'd be spending a long night on an orange Metro bench. I doubt she did; the conductors usually walked the length of the train before pulling into the yard and someone would find her at some point. But all I could think as she slid past was, glad that's not me. I thought about waving to her but didn't, and I'm glad, as it probably wouldn't have cheered her up any. 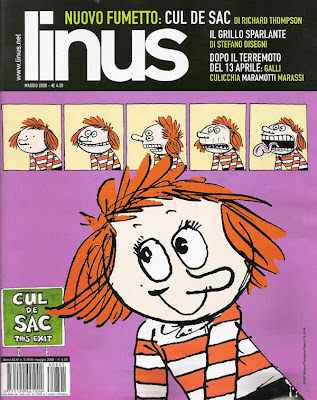 Linus is an esteemed Italian comics magazine that publishes Italian cartoonists & writers as well as international strips & features. 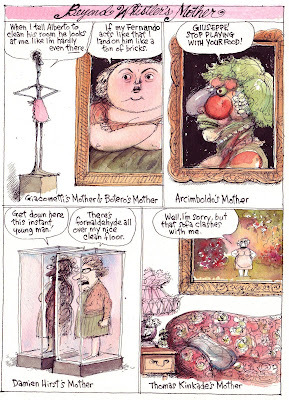 This is the cover of the newest issue, in which Alice Otterloop makes her debutto. And, oh boy, my friend Max Olla of Balloons Blog has sent me some copies so I can enjoy the comic antics of the Otterloops in the language of Dante, especially if they go to Hell. I can't wait to see the magazine, though I'm warned that the Italian mail can be slow. If I start now, maybe I'll have mastered Italian by the time they get here and I'll understand all the jokes. The above is last Sunday's Cul de Sac. This is an idea I had about 18 years ago. At the time, the Post's Sunday Outlook section was interested in maybe running a cartoon by me every week, and I came up with about a dozen roughs to show them what I had in mind. This is the sketch of the sofa-man I did for the Outlook editor. The stuff I turned in was okay, nothing special, some better than others. For various reasons we never pursued the weekly cartoon deal. But I still liked this idea, so when I turned in some roughs to Gene Weingarten when we were talking abou maybe running a cartoon by me every week in Sunday Style, I resurrected this one. 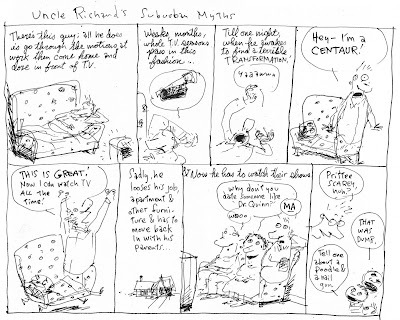 Then, when the cartoon that eventually became Richard's Poor Almanac launched, I finally used the sofa-man sketch, but I stretched it out to two weeks. 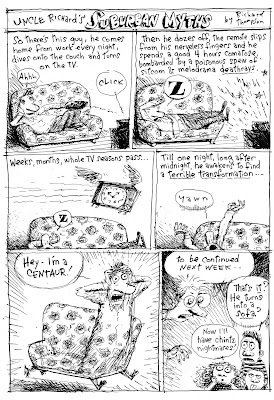 The cartoons below ran in mid-1997. For those not from the DC area, Wendy Rieger is a local newscaster who's cute. 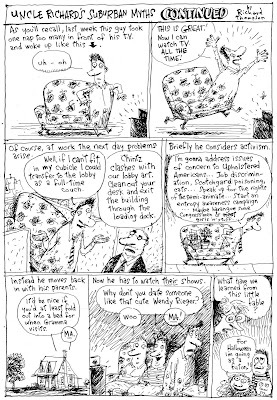 Some day I'll use the sofa-man idea again, maybe in a graphic novel, something Kafka-esque. Instead of a big bug Gregor Samsa wakes up to find himself transformed into an ugly sofa, and he gets left on the curb where he's picked up by a guy scrounging for furniture for a group house in College Park, Maryland. Hijinks ensue and he finds true love at the end with a fainting couch. See? This stuff writes itself. Contrary to the previous post, Mother's Day was founded 100 years ago by Anna Jarvis, whose single-minded efforts to recognize the accomplishments of mothers led to the Day's recognition as a national holiday in 1914. Her single-minded efforts also led her to become embittered by the holiday's commercializatiton at the hands of greeting card companies, candy manufacturers, flower distributers, etc, to the point where she spent most of her life and family fortune fighting those who'd tainted her holiday. She never married or had children. I learned all this last year when I illustrated a short piece on Jarvis in Smithsonian Magazine. This is all true, every word, I swear. 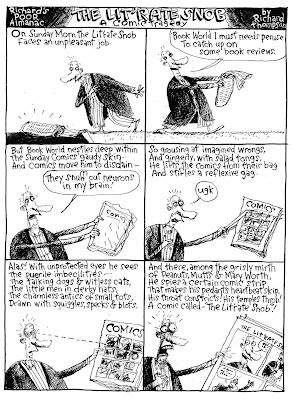 According to Mike Rhode's ComicsDC blog , yesterday was the anniversary of the first appearance of Ben Franklin's 1754 "Join, or Die" cartoon in the Pennsylvania Gazette. This image is regarded as the first American political cartoon, and there's an interesting Wikipedia page about it. 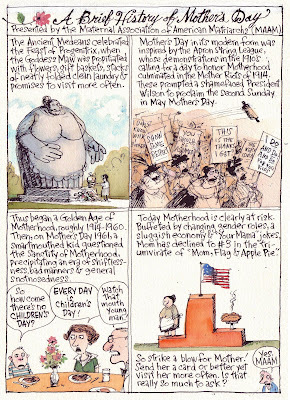 For Franklin's 300th birthday a few years back, I drew this. Franklin has always seemed like the most approachable of the Founding Fathers; he's a foxy grandpa, witty courtier, twinkly-eyed roue', home-grown Leonardo, and philosopher who wouldn't be king all rolled into one gouty package. And a pretty good cartoonist. If only he'd pursued it, what couldn't he have accomplished? If I remember right, the painting everybody knows as "Whistlter's Mother" is really entitled "Arrangement in Grey and Black". Whistler was a great painter and an even better etcher, but not too sentimental and a real full-of-himself jerk half the time, at least. He was pretty dang witty too, at least in person; when he sat down and tried to be witty for posterity it came out strained and mannered. His book, The Gentle Art of Making Enemies is unreadable, except for the title. This cartoon doesn't have much to do with Whistler, except for the title. A current self-portrait. More later, when there's time. 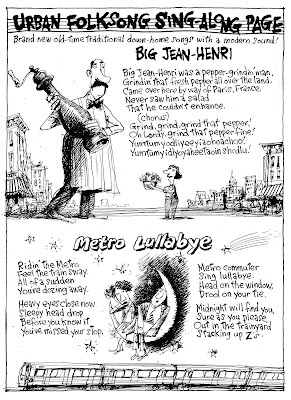 This is maybe my favorite New Yorker cartoon, or my favorite that's not by Chast, Shanahan, Zeigler, Booth.... OK, it's my favorite by Robert Weber, the master of the soft pencil line. I like it because it's beautifully drawn, detailed without being finicky, sharply composed, surprisingly gentle, and it's got Pliny the Elder in it. Something about Pliny the Elder is inexplicably funny. He named his kid Pliny too, and who names a kid Pliny any more? And you know every angel in that giant pile of angels wishes the guy with the camera would quit fussing around and take the damn picture. That's it, I just like this. 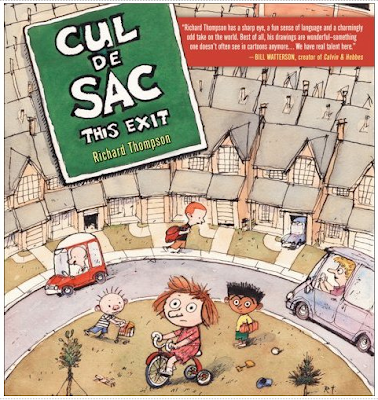 Alert readers (I have no other kind) may have noticed the "Cul de Sac: the Book" link to the right there. 128 pages of real paper; real ink too, a carbon-petroleum-beef mix, none of that soy stuff; there's some glue in there somewhere, too, I don't know what kind it is but don't eat it; an insightful foreword; 40+ pages of the original watercolor Cul de Sacs as they appeared in the Wash Post Magazine; the first 6 or 7 months of newspaper strips in b&w or color as appropriate; a brand new, never-seen and original isbn number; three laughs guaranteed, the rest are gravy. about 15 bucks including shipping; several hours of your valuable time; the respect of your peers who don't read comics because they're for little kids; some of you faith in humanity, because of all the scathing insights contained herein; your patience, because this thing isn't coming out till late summer. 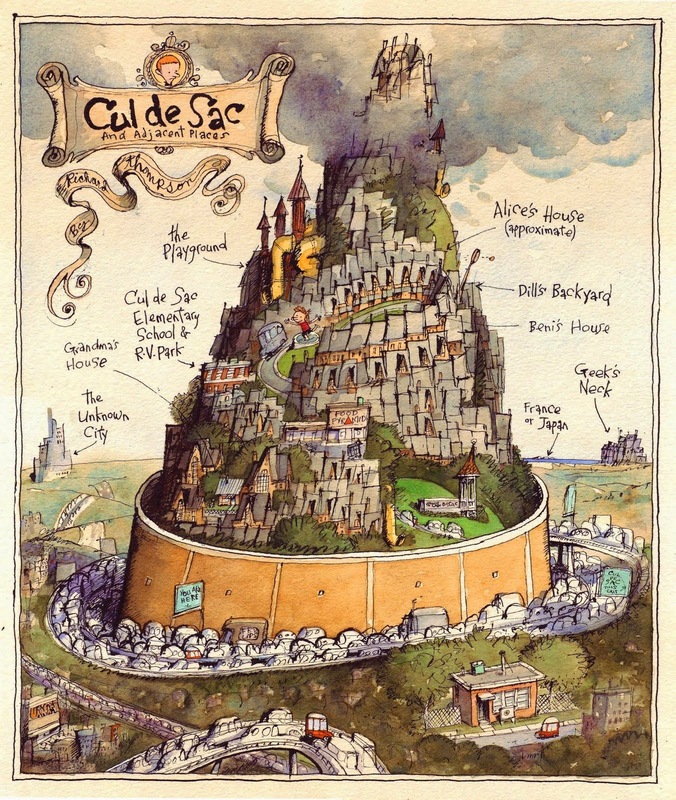 Also, for the first 50 people who buy Cul de Sac, here's a limited offer! Drive slowly by my house and I'll wave to you from my basement window! Make sure your receipt is plainly visible so I'll know it's you. I got an email today from an alert reader who sent a link to the Comics I Don't Understand website. 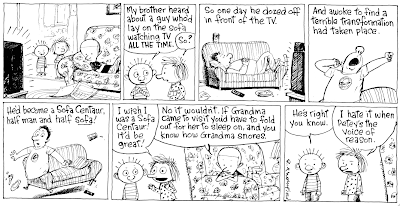 This site, for those unfamiliar with it, is where you go when you've got a comic you don't understand, and you post it and a discussion follows in the comments section where other readers try to unravel the mystery of said strip. Now that makes more sense, and it's subtle, and warm and funny, yet pointed and full of heartache. OK, it's not any of that stuff, but it does make a bit more sense and it doesn't sound as unsavory as the final version. There are "Kiss and Learn" signs in front of schools around here to mark where you can drop your child off, and they parody the "Kiss and Ride" signs at evey Metro station in DC. So when I redid the rough sketch last month I carefully did it wrong, and when I did the final I lettered it in wrong again, thereby blowing the joke entirely. Proving that I don't read what I write, though my wife did ask me about it, and I sat there and read it again and didn't see anything wrong with it. Every one of these is drawn from life, especially the last one. 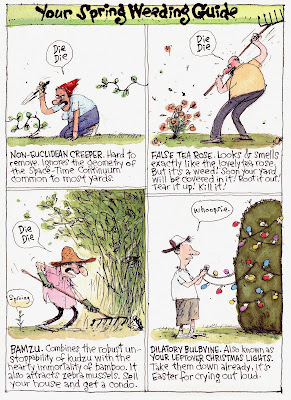 We once kept Christmas lights in our big shrub in front till summertime, and I snuck out one night and pulled them out, hoping nobody'd see. We should've just kept them there and plugged them in, like it was intentional. Nothing much in our yard is intentional. Do I make less sense in English or in Italian ? I know for sure it sounds better in Italian. I figured something with wiggly lines would be appropriate after the earthquake, so here are two masters of the inky jitters, Ed Koren and R. O. Blechman. Back when, I tried to draw like both of them, sometimes simultaneously, with unsatisfying results (about the third drawing I did for the Post was one where I tried for Blechmanian spareness, but I over-did it and the drawing practically evaporated in printing; I thought that was the end of my career right there). But nothing'll free you up from the awful tyranny of a neatly inked line like these guys. That's not exactly true, their lines are perfect, it's just that neatness doesn't count. Koren draws the spaces in between things and his lines jump from one to the next like electricity, but slower, like dust motes. And Blechman draws like each line's a teeny organism in itself and they all just met up at this moment to form into something worth looking at. So there was a big boom and the house shook slightly this afternoon. 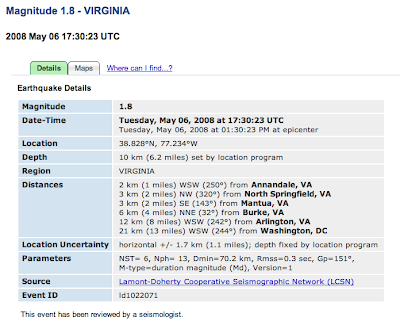 And this is why, according to the US Geological Survey. And get a load of this sculpture of Rumsfeld by Oliphant! I don't know about you, but it makes me itch to take a big lump of wax and express my feelings for various incumbents and incumbent wannabees, and their henchmen too. Those in the DC area can get a load of this sculpture in person if they head over to the Stanford in Washington Gallery on Connecticut Avenue near Woodley Park. Along with almost a hundred other Oliphant drawings, prints and sculptures. Go, it's cathartic! Well, Cartoonist Day is over for another year and it couldn't happen soon enough for me. But it's allegedly Cartoon Appreciation Week, and to celebrate I'll put up some random cartoonlike things that float my boat and you might like too. 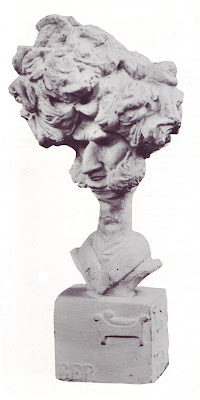 This is by the 19th century French scupltor Jean-Piere Dantan, known as Dantan Jeune, who sculpted many serious portraits of contemporary politicians, artists, writers, musicians, and such. He also did caricatures of them, most of them pretty dang wonderful (though not as fine as Daumier's). This is Hector Berlioz, the great romantic composer who was slightly nuts and had one of the great heads of red hair in history. It's from the book "Dantan Jeune, Caricatures et portraits de la societe romantique". My French isn't so hot, but looking at all the charming little gargoyle heads filling its pages make me wish I knew the first thing about sculpting. As I learned last year from my old friend Barchan, today is May the Fourth Be With You Day. Back in 1977 I went to see Star Wars (the first, real, one) on its opening night at the Uptown Theater with a bunch of friends, which establishes my geek cred if there was any doubt. All the shows were sold out, there was a line around the block, and we ended up seeing the added-on midnight show, and some of us appeared in a photo in the Wash Post the next morning of all the geeks in line to see a movie. But we all knew it was an event somehow, and the line was the place to be. The Uptown is still the best theater in DC; it's got a huge screen and a balcony and the blockbusters open there. I've stood on that sidewalk out on Connecticut Avenue for dozens of movies since and nowadays I drag my daughters along, or vice versa. Each of the subsequent movies in the SW franchise have been another big step down for me, until when the last one came out and I was ready to throw something big and wet at the screen. The above cartoon was drawn before I saw it, but I'd already figured it wasn't going to be much fun. George Lucas will likely spend the rest of his career tinkering with his Star Wars oeuvre, reworking CGI effects and monkeying with the explosions and stuff. Which is fine by me as long as he doesn't make any more crummy movies. With the excitement of Free Comic Book Day is behind us, it's time to prepare for the big celebration on May 5th! And May 5th, as we all know from watching all those beer commercials on TV, is Cartoonist Day! At least, I think that's what those beer commercials are talking about; what else could the Fifth of May be? 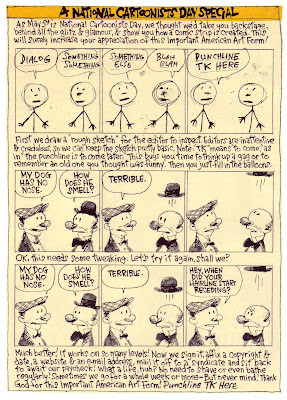 According to the Cartoonist Day website , the date was chosen because the first comic strip, The Yellow Kid, first appeared in a newspaper on May 5th, 1895. 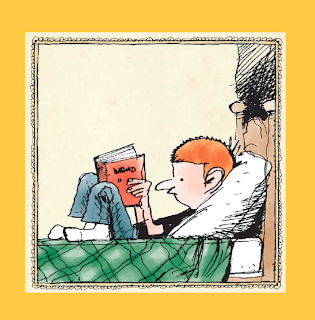 And I believe The Yellow Kid is still running in about 5000 papers worldwide, now drawn by its creator's grandson's second cousin's brother-in-law. And what's more, May 3-10 is Cartoon Appreciation Week! So I urge everyone to spend the week Appreciating Cartoons, and if you see a Cartoonist, give him or her a hearty slap on the back, a big "thank you" and maybe as much change as you can spare. Unless he happens to be the Yellow Kid's creator's grandson's second cousin's brother-in-law. I'll spend the week posting cartoons, and drawing the g-dd-m miserable things too. This one is drawn from life, as we have a cat named Fred and a mouse somewhere in the house. And that looks a lot like our house, too. This is today's Almanack. I like the last one best. Countdown to Free Comic Book Day Part II: Lo, It Approacheth Ever Closer!! The excitement is at fever-pitch as we approach Free Comic Book Day 2008, which is of course tomorrow. This cartoon is from last year. Mangaloid Wars X: Giant Spazzoid Zombie Robots Invade! is just about my second favorite thing I've ever written, and if they made a movie of it I'd totally go see it. If only to see Michael Bay's take on Tennessee Williams. Again, thanks to Mike Rhode.